Value Added Tax (VAT) is a particularly unfair form of taxation. Poor people pay more as a percentage of their income than the rich. “The cuts” are a way of making ordinary people pay for the economic crisis caused by the bankers. When the banks got into difficulty, the British state stepped in to prop them up, but at huge cost. In order to make up this money, the government is now attempting to pass this cost onto ordinary people by cutting services, laying-off staff, increasing charges, inflating tuition fees and raising VAT. We believe that these cuts are unnecessary an attack on our communities. In fact some leading mainstream economists agree including the Guardian’s Larry Elliott and Nobel Prize winner Joseph Stiglitz who have both warned that the severity of cuts being pushed by the coalition could kill off the economic recovery and push us back into a recession. The current government is made up of millionaires and public schoolboys who don’t understand the lives of ordinary people. When the new cabinet was announced in May, it emerged that 18 of the 23 full-time cabinet members were millionaires. The Chancellor George Osborne is a prime example. Born Gideon Oliver Osborne, he is a former public schoolboy, attended Oxford, stands to inherit the Baronetcy of Osborne and is worth an estimated £4million. We have seen groups emerging across the country to resist the cuts. In Nottingham, Notts Save Our Services has been launched to try and coordinate local campaigns. By linking up the cuts against different cuts (to education, health, welfare, social care and much more) we can put more pressure on the government than we could working separately. The campaign to reduce (and perhaps ultimately abolish) VAT is another strand of this campaign. 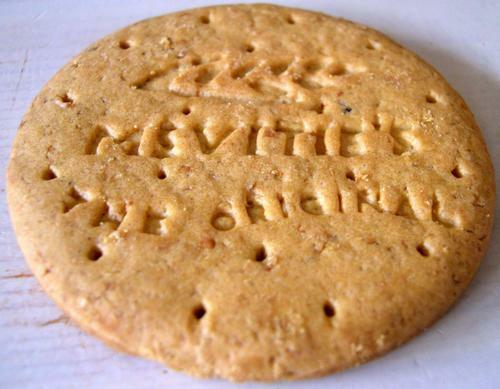 The biscuit theme was intended as a way of making a fairly boring issue (VAT) at least vaguely interesting. We chose biscuits because of the bizarre laws which mean that biscuits are subject to VAT, but cakes are not. In a relatively well-known case, McVities went to court in order to prove that Jaffa Cakes were indeed cakes and hence exempt.